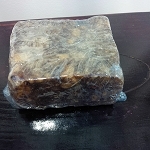 People praise African Black Soap for its skin-conditioning qualities. Most users rave about the noticeable changes in their skin, especially the face, with regular use of black soap. We've been asked about it so often, we decided to bring it into our lineup of all-natural handmade soaps. 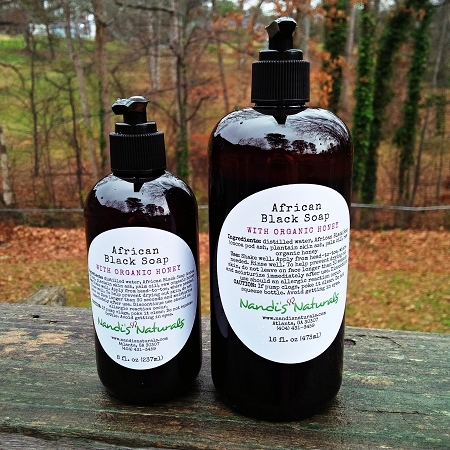 Our black soap is West Africa-derived. Outside of distilled water used to liquefy the black soap bars and the addition of organic raw honey to help provide extra moisturizing qualities, we haven't changed the soap in any way. We believe you'll be pleased with what we've managed to brew up. 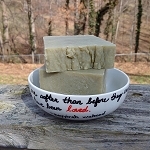 The lather is plentiful and creamy! Available in a convenient pump, you don't have to worry about spilling it everywhere. Use only what you need. Use: Can be used from head-to-toe. Squirt the needed amount onto a washcloth, sponge, hands or directly onto skin, work into a lather, massage into skin and hair, and rinse well. Immediately discontinue use should an allergic reaction occur. Use Tips: Do not leave black soap on the face longer than 30 seconds, as it can be drying on the face. Pat dry. Apply a good moisturizer immediately after rinsing. Our "To Face, With Love" Facial Cream makes a wonderful day or night cream, and is the perfect followup to cleansing. CAUTION: If the pump clogs, poke it clear. To avoid getting soap in your eyes, DO NOT squeeze the bottle or attempt to force out soap by depressing roughly on the pump. You can also run hot water across the pump's nozzle to melt and rinse away dried soap. Do not remove the pump from the bottle to do this, as you risk getting non-distilled water into the contents. This is a great face soap! My face felt sooooo clean and without being dry after! I highly recommend. It is gentle and effective. I love this soap. After using it on my face and body I feel refreshed and clean. I also use an all natural toner on my face after the black soap and To Face with Love moisturizer which compliments my skin perfectly. Highly recommend. T The pump is most convenient and less messy for me...seemed some was wasted when i used the bars. NANDI'S has ORGANIC [NATURAL] honey. I USE FROM MY HAIR TO MY TOES! 1 NATURAL PRODUCT > bottles of shampoos, conditioners, moisturizers, bar soap [scrum] littering your shower / bath area. 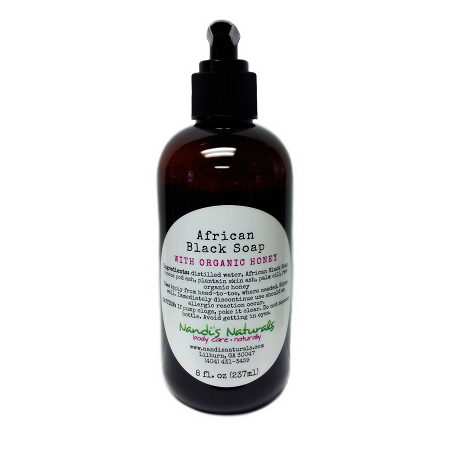 The pump is most convenient and less messy than bars and tubs of BLACK SOAP .. No BLACK SOAP wasted with pump. NANDI'S has ORGANIC [NATURAL] honey.